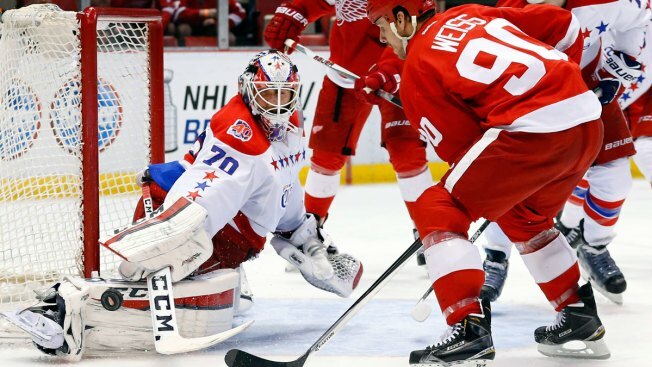 Washington Capitals goalie Braden Holtby (70) blocks a Detroit Red Wings center Stephen Weiss (90) shot in the second period of an NHL hockey game in Detroit Sunday, April 5, 2015. Capitals fans can start buying playoff tickets for the team's first three home games. Tickets for the first three Capitals home games will go on sale to the public on Tuesday at 11 a.m. Fans can buy tickets on WashingtonCaps.com, at Kettler Capitals Iceplex and at all Ticketmaster outlets, including the Verizon Center box office. Fans can also get tickets by calling 202-397-SEAT. The Capitals clinched a playoff berth Sunday after they beat the Detroit Red Wings 2-1 and the Ottowa Senators lost to the Toronto Maple Leafs. It is the seventh time in eight years that the team has made the playoffs. There are still two games to play in the regular season.